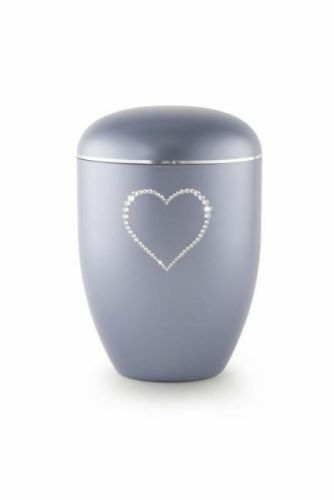 This steel grey coloured biodegradable urn with a swarovski heart motif is made from Arboformwhich is a sustainable thermoplastic material and will biodegrade in 5-8 years once place in soil but will remain completley intact until burial. The height of the urn is 27cm with a diameter of 18.5 and will hold upto 5 litres and secures with a push on lid. This is not a stock item so please allow 2-3 weeks delivery.